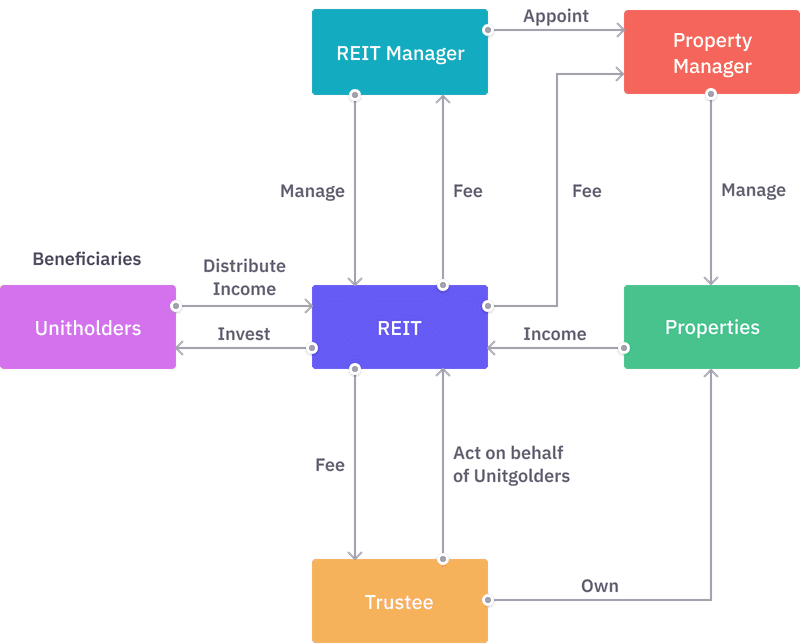 A Real Estate Investment Trust (REIT) is a professionally managed entity that is setup as a collective investment scheme primarily to own, operate or finance income-producing assets across a diverse range of real estate sectors for the benefit of their shareholders (or unitholders). Modelled after mutual funds or unit trusts, they pool together funds by initially issuing shares (or units) in the REITs to investors. These shares are individual units of ownership and represent an entitlement to the benefits in the REIT; for example, rights to the distribution of income and the rights to vote on policies. These pooled funds are directly used to invest in real estate or real estate backed assets with the objective of profiting both from the recurrent income and capital appreciation. Income derived from the REIT’s investments are redistributed back to investors in proportion to their investment amount. The more shares (or units) they own, the larger their fractional entitlement in the REIT. In this way, REITs make it easier for investors to gain exposure to the long-term capital appreciation of the real estate sector while enjoying regular income through the distribution of dividends. In most jurisdictions, tax transparency laws dictate that a REIT must pay out at least 90% of their taxable income to shareholders in order to qualify and maintain their status as a pass-through entity and therefore be exempted from paying business tax. In this way, REITs allow investors to avoid double taxation, i.e. paying taxes both at the corporate and individual level. In summary, REIT investors enjoy all the benefits of owning a tax efficient real estate asset with low capital outlay – without having to go out and source, buy, manage or finance the property themselves. This dramatically reduces the barriers of real estate investing and enables investors to rapidly build up a portfolio of valuable real estate. Most REITs operate on a simple business model, i.e. they acquire real estate and lease out the space, hence generating recurring rental or income on its real estate. The income generated is then distributed back to shareholders (or unitholders) in the form of dividends. REITs utilise a trust structure to safeguard investor's interests. Trusts are legal agreements established and governed by a Trust Deed where the ownership of one’s assets is transferred to an entrusted group (Trustees) to manage the assets and act in the best interest of 3rd party Beneficiaries (Shareholders or Unitholders) and in accordance to the provisions of the Trust Deed. Additionally, REITs further segregates the duties of the Trustee and Manager. As a result of this trust structure, the legal and beneficial ownership of assets are separated. The Trustee is the legal owner of the real estate assets while these assets are professionally managed by the Manager. Both the Trustee and Manager have the fiduciary duty to always put the interests of the Beneficiaries above their own. The Trustee is responsible for the ownership and safe custody of the REIT’s assets. They act on behalf of unitholders to ensure the REIT Manager complies with applicable laws and performs its requisite duties as laid out in the Trust Deed. The REIT Manager, on the other hand, is appointed to manage the REIT in the best interests of the unitholders, which includes setting strategic direction, managing assets and liabilities, as well as providing recommendations to the Trustee on the acquisition, divestment or enhancement of assets in accordance with the REIT’s stated investment mandate. In short, the REIT Manager acts as an investment portfolio manager, and is usually paid a base fee for its service, as well as bonus fees should its performance exceed expectations. The REIT Manager in turn has the authority to appoint Property Managers for each property managed by the REIT, whose role is to manage the day to day operations and maintenance of the property. The Property Manager is paid a fee for its services. Most REITs have sponsors (typically but not necessarily property developers) which provide backing to the REIT by injecting their own properties into the REIT during listing. These sponsors continue to support the growth of the REIT by providing the REIT rights to acquire the sponsor’s future pipeline of properties. These sponsors may sometimes themselves be a major unitholder of the REIT they sponsor. Properties that are tenanted out provide a steady stream of income to the REIT. Income from the properties are first used to pay the expenses of operating the REIT, such as interest payments, manager and trustee fees, whilst the remaining balance can be kept in reserve and/or distributed to unitholders. As per tax transparency laws in most jurisdictions, a REIT must pay out at least 90% of their taxable income.